Passed away peacefully on 31.3.2019. Surrounded by loved ones. An amazing and much loved Gentleman. Husband to Joan. Father to Barry, Deb and Sue. 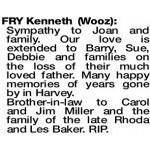 Stepfather to Jeff and Yvonne (dec). Father in law to Anne, Pete, Gary, Mimi and Nicole. Grandie to 17. Great Grandie to 15. "A true cattleman" Forever loved and remembered. 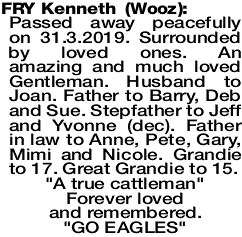 "GO EAGLES"
The Funeral Service to honour and celebrate the life of the late Mr Kenneth Henry "Wooz" Fry of Eaton formerly of Benger, will be held in the The Funeral Chapel, 59 Uduc Road, Harvey commencing at 11.00am on THURSDAY (04.04.2019). Following completion of the Service, the Cortege will proceed to the HARVEY General Cemetery, South West Hwy arriving at 12 noon. Sympathy to Joan and family. 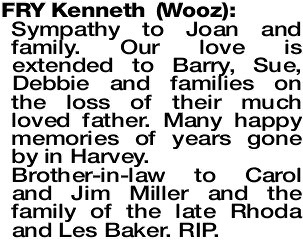 Our love is extended to Barry, Sue, Debbie and families on the loss of their much loved father. Many happy memories of years gone by in Harvey. Brother-in-law to Carol and Jim Miller and the family of the late Rhoda and Les Baker. RIP.